The law on the state financial guarantees for the provision of medical services and medicines, regulating healthcare reform, should be adopted by the end of May 2017, otherwise the reform will be postponed until 2021-2022. 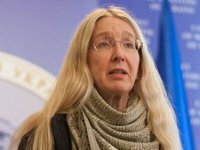 This was stated by the acting Health Minister Ulana Suprun at a meeting of the Regional Development Council in Kyiv on Monday. "It is necessary that the main law of the reform be adopted before the end of May this year, since if we postpone the reform it will not be carried out until 2021 or 2022 due to the political cycle," she said. Suprun said: "If it [this law] is not adopted until the end of May, we won't be able to allocate funds for family medicine starting from 2018, we won't be able to start family medicine since July this year, we won't be able to calculate the price of the service until September 15, we will not get a secondary and tertiary level [of a medical aid] in the budget for 2018." According to the minister, the Ministry of Health hopes that it will be able to submit this bill at the National Reform Council "at the invitation of the president". "Health care reform is not done by one minister or ministry - the whole state performs it. Qualitative and affordable health care is an absolutely accessible goal. "We start paying for being treated, not for being at the hospital, and we ensure a decent payment for doctors' labor," she said. As reported, last week the Cabinet of Ministers of Ukraine approved a package of bills concerning the guaranteed package of medical services, the introduction of the institute of a single national insurer and the introduction of a co-payment system for medical services that are not covered by a single guaranteed package. According to the developed projects, the state, in particular, will fully cover emergency medical care, primary medical care and palliative care in the last days of life. The Ministry of Health proposes that the volume of services and tariffs be approved by the Cabinet every year until September 15.